The new, updated edition of the Skira best-seller on twentieth-century art. This handy manual is for those who wish to understand what art was in the last century and what it represents today. The book, whose structure is essential and synthetic, aims to divulge the pleasure of art to those who have never delved beyond its surface, and above all to describe how it has become spectacle and performance in recent years. 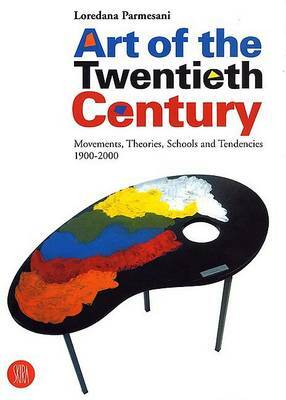 Following an analysis of the theories and poetics that tempestuously traversed the historical avant-gardes and the neo-avant-gardes of the twentieth century and contributed to their extraordinary vitality, the author focuses on and explains the principal artistic phenomena that, starting in 1980, marked the period defined as post-modern, which was characterised by performance and a system of economic-financial art. The last chapter describes the arrival of postmodern up to its possible decline, marked by the social events of 2007 that, by abandoning the special effects of immateriality, has headed in a direction that is more tangible, worldly and concrete. Buy Art of the 20th Century and Beyond by Loredana Parmesani from Australia's Online Independent Bookstore, Boomerang Books. Loredana Parmesani is an art critic and author of numerous publications on contemporary art.